This month, Whitworth claimed the title of Washington Monthly’s highest-ranking master’s-level university in the Pacific Northwest. Nationwide, Whitworth ranked No. 9 among 681 other institutions in the country. Washington Monthly’s master’s-level universities are classified as schools that offer a range of undergraduate and master’s-level programs, but few doctoral degrees. The magazine’s ratings are based on schools’ contributions to the public good through social mobility by recruiting and graduating low-income students, through producing cutting-edge scholarship, and through encouraging students to give something back to their country. In keeping with Washington Monthly’s ranking criteria of social mobility, service and research, Sanders attributes Whitworth’s high ranking to the school’s involvement with community-oriented programs such as Act Six, service-focused projects such as Whitworth’s annual Community Building Day, and faculty members’ active research with their colleagues as well as with students. Trinity University, in Texas, tops Washington Monthly’s national list, followed by St. John’s College (N.M.), Converse College (S.C.), Nebraska’s Creighton University and California State University, Dominguez Hills. Other schools in the Pacific Northwest that made the overall master’s-level university rankings include Pacific University (No. 31), University of Portland (No. 34), Seattle University (No. 42), Northwest Nazarene (No. 60), Gonzaga University (No. 66), Seattle Pacific University (No. 120), Concordia University (No. 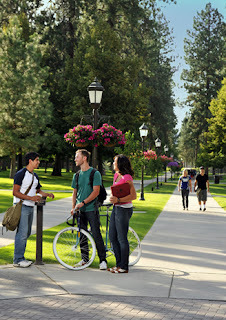 131), George Fox University (No. 156) and Pacific Lutheran University (No. 218). The complete rankings can be accessed online at www.washingtonmonthly.com/college_guide/rankings_2012/masters_universities_rank.php. Whitworth also recently claimed the title of Forbes magazine’s No. 10 private school in the Pacific Northwest. This month, The Princeton Review named Whitworth as one of its “Best in the West” universities, a ranking that takes into account students’ reports about their campus experiences in an independent survey. Barbara Sanders, provost of academic affairs, Whitworth University, (509) 777-4303 or bsanders@whitworth.edu.